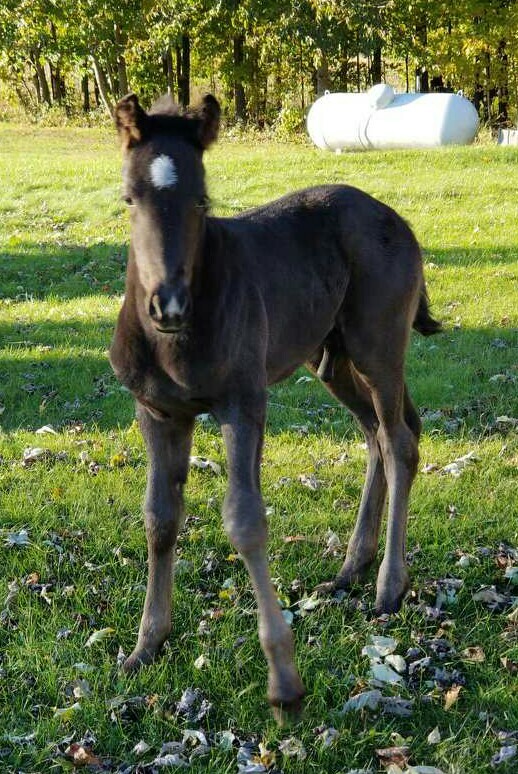 Timothy and Elizabeth’s new colt from mother Shiann. As Lovina reminisces and reflects here, life is always moving on. Supper dishes are washed, and most of the family is relaxing and getting showered before bedtime. Hamburger potato casserole was on the menu for tonight. As I sit here in my recliner writing, my mind goes back to 16 years ago, when I first started penning my first column. Mother had just died unexpectedly, while attending a few book signings in Missouri. She was 66. Life changed so much for our family on that day. I was nervous when I wrote that first column. I was 31 years old, and my husband Joe and I had six children. 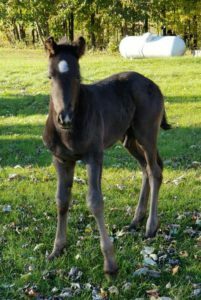 Joseph was our baby, only three months old. Loretta was two, Benjamin three, Verena four. Susan was six and in kindergarten. Elizabeth was eight and in second grade. By now, 16 years later, there have been so many changes! Rereading my earlier columns brings back memories of those years when our children were so young. In one column I wrote that I had water heating on the stove to wash the laundry. Now I have hot running water, powered by solar, and I can put the hose right into my Maytag washing machine. Now that my washing machine is powered by the solar panels on our pole barn, there is no more carrying water to get that job done. I also wrote about my sisters coming to help in preparations for upcoming church services. It said sister Emma cleaned all three of my kerosene stoves and we cleaned all the kerosene lights. Now I have a propane gas stove and propane and battery lights. It was hard to go on, with both my parents gone from us so suddenly. Dad had passed away a little over two years before Mother. At the time, it seemed almost impossible for life to go on without them. Remembering my mother’s words—things she always said—helped me a lot. She always said, “God makes no mistakes.” So why would we want to question His ways? I also wrote in one of my first columns that I was trying to get the buggy blankets dried, as we had been caught in a rain. Yes, we had open buggies in those days, and those winter rides could get pretty cold! In rainy weather we had umbrellas to keep us dry as much as possible. We now have covered buggies and heaters to install in the cold winter months. As 2002 ended and we started the new year 2003, we faced another year of changes. Our home place was sold, as were all our parents’ belongings. Life went on, but there was always someone missing from our lives. As we entered the year 2004 we started thinking we need a change. So after much thought and many prayers, we packed our belongings and with our six children made the move to Michigan. It was a big change to move a few hours from our home and with the children still young, and it was a busy time for all of us. It was a big change—but sometimes change is good! The girls attended a new school and made new friends. In May daughter Lovina was born to us. There were complications, and I spent a week in the hospital after her birth. Sisters Verena and Susan and sister Emma, Jacob and family also made the move to Michigan. We were glad to have family join us. In 2005 we were blessed with our eighth child, Kevin. The years have gone by so fast, and of course all the children are older. I used to think that life would eventually slow down, but it seems to only get busier with the years! Then again, it could be that this grandma is just slowing down gradually. We have had so many blessings throughout the years that far outnumber the bad times. May God be with us as we travel into the unknown future. And we wish God’s many blessings to all of you as well! This week I will share the recipe I received from a reader in Kansas. It’s very easy to make. Preheat oven to 325 degrees. Line 18 cupcake cups with paper liners. Melt butter and chocolate chips together in a saucepan over low heat, stirring until smooth. Let cool. Beat eggs and sugar together in a mixing bowl until thoroughly combined. Mix flour and vanilla into egg mixture. Fold in chocolate mixture until batter is smooth. Pour batter into prepared cupcake cups, filling them about 1/2 full. Bake in preheated oven about 30 minutes or until toothpick inserted into center comes out clean or with moist crumbs. Another busy week! Yesterday was a long day. Sister Emma and sons Jacob, 18, and Steven, 11, daughter Elizabeth with Abigail, and daughter Susan with Jennifer assisted us with our work. Steven had his eleventh birthday on Monday, July 30. Son Kevin and Steven always enjoy spending time together. They both have muscular dystrophy, so they are limited with what they can do. Other children at that age don’t always want to take the time to play with someone that is slower at walking. It’s the age when others are active and want to run and play sports. So most of the time these two boys keep each other entertained at school, church, etc. Until I had handicapped children I never thought so much about it but once you are at this end of it you really appreciate the people that are considerate of your children. It is hard for boys this age to sit back and watch the other boys running and playing games that they can’t participate in. God helps us through our trials. Yesterday our back entrance was cleaned from top to bottom. Some kitchen cabinets were also cleaned out. I sure was glad for what all was done. Everyone who came to help had a breakfast of biscuits, sausage gravy, fried eggs, cheese, chocolate chip cookies, watermelon, coffee, milk, and juice. For lunch we had vegetable soup and hot dog sandwiches. In the evening my husband Joe, sons Joseph and Kevin and I went to Menards (a large lumber and supply store) to pick up our order of trim and wainscoting. Yes, we are finally getting our trim on. One year after another slips by since we moved in our new house. It seemed we could always use the money somewhere else and that is still the case but Joe said we need to get it done. It will look a lot better I’m sure. We have the family coming to help us with it on Saturday. Then we have one more week after that to be ready to host church services. Daughter Verena, 20, is disappointed to be out of a job again. Nephew Emanul shut down his woodworking shop where she was a secretary. She had found some work suitable for her and it was working so good for her. Again we will trust God to lead the way. I sure am glad for her help with the cleaning but I understand that helping her mother doesn’t pay. Last Friday my sisters Verena and Susan spent the day here helping. They cleaned a lot of windows. They used white vinegar in water to wash them and use cheese cloth towel to dry them. It made the windows nice and sparkling. Joe made grilled hamburgers and French fries for our supper before they left for home. I sure appreciate everyone’s help. We were invited to a fish fry at neighbors Joas and Susan’s place last night but couldn’t attend as we had to go to Menards. I have pickles that need to be canned today. 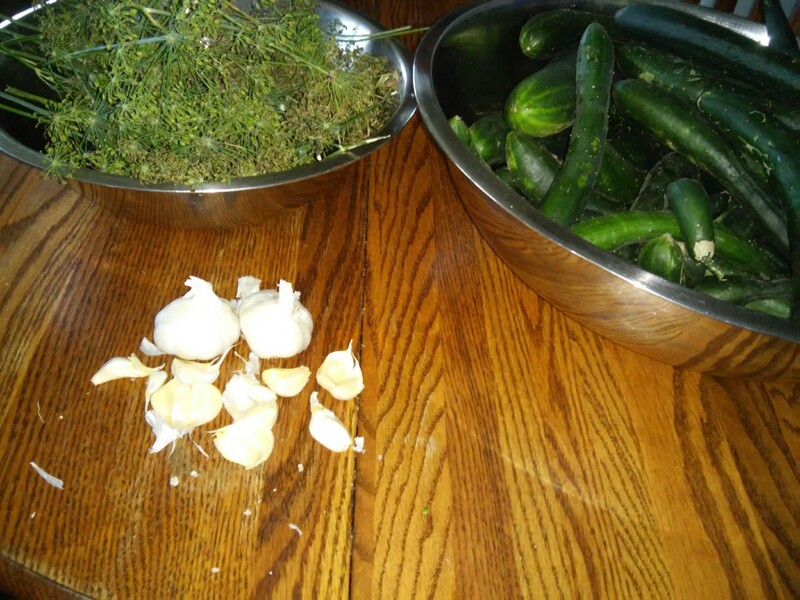 I will also make freezer pickles with them. 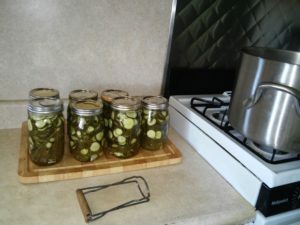 For canning pickles, I use the recipe that a lady in our church gave me called sweet dill pickles. I will share the recipe with those of you that like canning your own pickles. 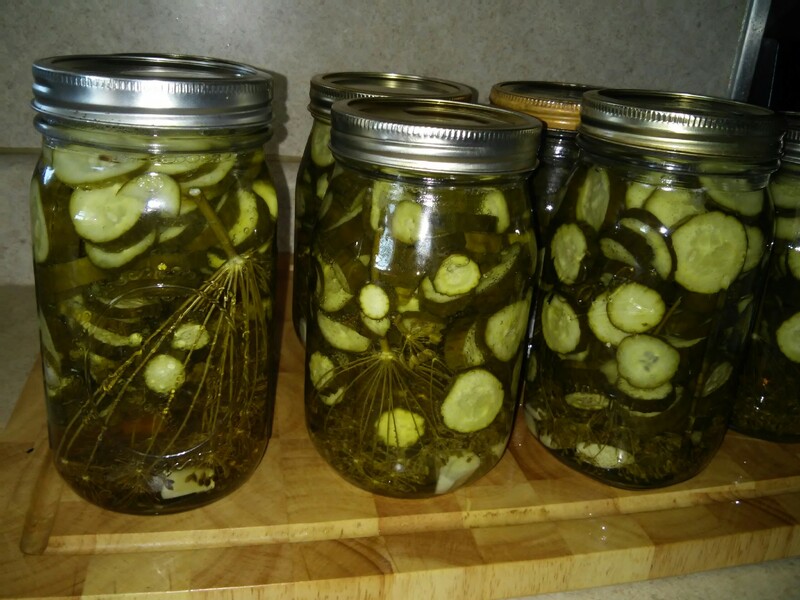 Put sliced cucumbers, garlic, dill, and alum in jars. Heat vinegar, sugar, salt, and water together then pour over pickles. Cold pack according to your guide for water bath canning. Makes 3 quarts.